« Where Do Poems Come From? Thanks, Vishy, it’s great to hear from you. BTW, I just read The Wall, because Claire wrote about it after you did and I was curious. Fabulous book! 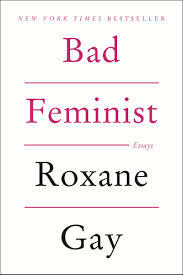 I will be curious to hear what people think of Roxane Gay in your readalong. Thank you for your comments and review. Feminism is certainly not one faceted and I do often feel that both men and women today do not realize that what they have was not an automatic right in the recent past and what we older ordinary women went through just to work paved the way for them. I get angry when I hear a young professional woman declare she isn’t a feminist – and explain she can only say that because of what older women went through! I know exactly what you mean. Thanks so much for commenting Linda. Beautiful review, Valorie! I have wanted to read ‘Bad Feminist’ for a while – I am waiting to do a readalong with one of my friends. I read a few essays from it though and they are definitely interesting. I did read one of the essays on the trauma that Roxanne Gay suffered, and it was hard to read. I loved reading your insights on the book and on feminism. Thanks for sharing your thoughts. I can’t wait to read the book. I am so, so excited that you read ‘The Wall’, Valorie 🙂 I can’t wait to read your thoughts on it! So, so happy! That’s so interesting Judy. If you ever do read I’d love to hear what you think. I have not read it, but it certainly sounds like I should. In the 90’s, I was the only female executive vice president at the company I worked at and was 10-20 years older than all my male counterparts. It was certainly interesting from both personal and professional perspectives since I was in charge of HR. 🙂 Thanks for the review.